Lightburn & Co was an Adelaide-based business established by Harold Lightburn in the suburb of Camden Park. The company initially manufactured household goods such as washing machines and small industrial products such as concrete mixers. In the 1960s Lightburn purchased a small sports car already under development in the UK, the Frisky, and from this developed the Zeta – a small car with a fibreglass body. The National Motor Museum holds three examples of these cars: a Sports model, the sedan ‘Runabout’ model, and a utility in the collection. These cars were sold between 1963 and 1966 with only approximately 400 cars produced. 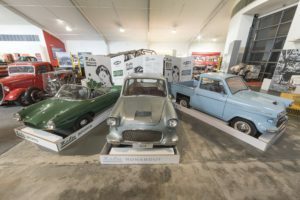 The Zeta is an interesting example of local automotive experimentation and the National Motor Museum is in the process of documenting the history of the company and car. We are seeking information, documents, photographs and advertising brochures for the Zeta car as well as the broader range of products and history of the Lightburn Company. If you are able to help and are willing to donate material or loan for the purposes of digitisation we would love to hear from you. Please email the Museum at motor@history.sa.gov.au or by phone on 08 8568 4000.